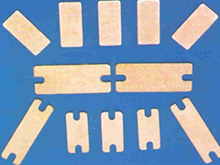 Cu/Mo70Cu/Cu (CPC) is a sandwiched composite similar to Cu/Mo/Cu comprising a Mo70-Cu alloy core layer and two copper clad layers. The ratio of the thickness in Cu Mo70Cu and Cu layers is 1:4:1. It has different CTEs in the X and the Y direction. Its thermal conductivity is higher than those of W/Cu, Mo/Cu, Cu/Mo/Cu and it is much cheaper.